Remember, this app requires Windows 8 or Windows RT and does not support MP3 players. The mini-player is in the upper right. 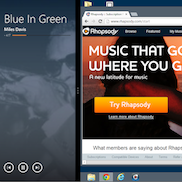 By Genre: Choose Radio from the Rhapsody home screen or navigation bar.